Modeled after the sturdiness and the mechanism of a combustion engine, The Bolt works with any Parker ballpoint compatible refill. It is handmade at KarasKustoms workshops in Arizona by passionate workers with all sorts of backgrounds: mechanical repairs, tools and machinery, design, and many others. For this reason, their products are unique, robust and extremely innovative. 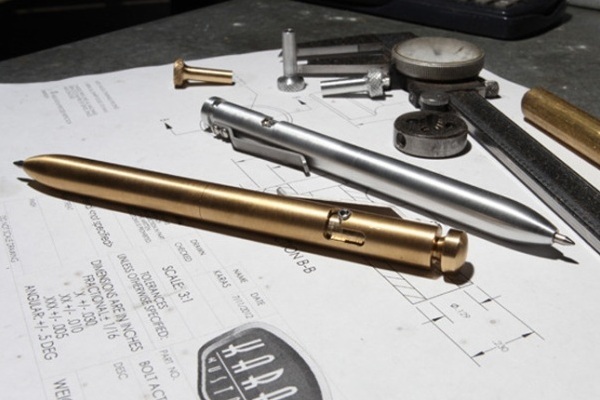 The Bolt comes in aluminum or copper, and may very well be the last pen you ever purchase. Available for $55 by pre-order only. Let us know what you think, leave us a comment. Register now to keep up-to-date with the latest trends and to be the first to receive our special editions or special offers for our subscribers. © Copyright 2012 BAXTTON.COM | All rights reserved. Web design by Lubie Interactive Communication.